You think space is empty? Well, it was before we started leaving junk up there. Image courtesy NASA via NatGeo. The most spectacular re-entry in the short history of the phenomenon was Skylab. Launched in 1973 (two years after Russia put its first space station into orbit), the first and only U.S. space station stumbled home six years later, part of it splashing into the Indian Ocean and another portion ending up in Australia. Maybe I’m dating myself here, but as a kid when I learned about Skylab I wanted to be an astronaut. I had this fantastic pop-up book about the space station that fired up my imagination. I really don’t want to think of it as space junk. (1) That’s a lot of stuff. There are approximately 4 million pounds of stuff up there. Maybe we need a professional organizer? Maybe next season HGTV will have a new show called Organize Our Space (without using space bags). (2) Size does matter. 110,000 total space debris objects measure 1 centimeter and larger. (3) A speck of paint from a satellite once pitted a space shuttle window nearly a quarter-inch wide. (5) It’s older than our new president. The oldest object still in orbit is the second U.S. satellite called Vanguard I, which launched on 1958 and operated for only for 6 years. (6) Now that’s a major wardrobe malfunction. In 1965 Gemini 4 astronaut Edward White lost a glove during the first American space walk. The glove stayed on orbit for a month at a speed of 28,000 km/h. (7) Old but not forgotten. 22% of space debris are old spacecraft. (8) The sky is falling! Big chunks of Skylab fell over western Australia in July 1979. (9) In April 2000, over 700 pounds of debris from a Delta II second stage rocket used with the Space Shuttle fell on farms in Cape Town, South Africa. (10) In January 1997, a 580-pound stainless-steel tank identical to the Delta II debris found in South Africa plowed into the ground in Georgetown, Texas and missed a house by only 50 yards. (11) In March 2000, the nosecone for a solid rocket booster from a French Ariane 5 rocket washed onto a beach near Corpus Christi, Texas. 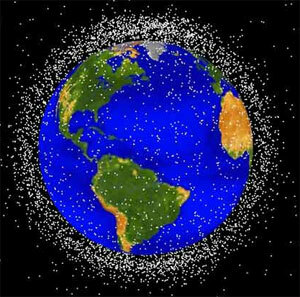 (12) As of 2000, the U.S. is responsible for more space debris than anyone else with 2,971 objects that do not include satellites or space probes. The former Soviet Union, however, has more potential space junk since it has launched the most satellites 1,335 (as opposed to 741 U.S. satellites). (13) About 40% of ground-tracked space debris come from explosions, now running at four to five per year. I think I just saw something on the news the other day that there’s a piece of debris the size of a refrigerator that’s supposed to hurtle itself towards earth any time now, and they don’t know if will burn up as it enters the atmosphere or not. Scary! I heard that advertiser want to start buying up space in Space! with stupid billboards and other junk. 13 Reasons why Costa Rica is Amazing! I wonder if aliens would think Earth had a bad mold-like problem, seen from a distance. I wonder when this will become such a hazard to future space travel that they will be forced to clean it up.